Are you a shop til you drop person? If so, you do not want to miss Lot 10. This is probably the biggest shopping mall I have ever seen. Where else could this shopping center be located but in the district with the best shopping and most awesome entertainment, Bintang Walk? With the Ritz-Carlton and the Regent hotels within a stones throw you are living it up in the style to which you could become accustomed. You should make a point of visiting in December when they have the big Shopping Carnival. That is the best time to find bargains with deep discounts. If you are looking for designer you have come to the right place. Kuala Lumpur is home to Lot 10 among other wonderful sights to see and Lot 10 is a sight to see. 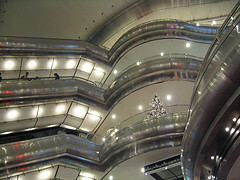 The shopping mall is anchored by the number one resident, Isetan Department Store. This is the Japanese store with everything. From groceries to tools, the multitude of stores within this store are something you will never experience again. Of course, that is unless you return for another visit, which is more than likely. This store has six floors of retail shops all by itself. Selling gifts, books, and clothes it will take you a few visits to find your way around. Then you can come back and really shop til you drop. Keep you calendar cleared for the next few days so you can come back to the main mall and see what they have. The outlets within this shopping center in KL will fascinate you with the Japanese art as well as the more familiar names of Nike and Esprit. There are almost 100 stores. Lets see, thats 10 stores a day for 10 days. Well, you get the picture. By the time you get to the last store the first ones will have some big sales going on. This is basically shoppers paradise. If you have a daughter that thinks of nothing but shopping, take her to this mall, spend the day and visit every store they have. She will either succumb to the shopping fever or tell you she never wants to shop for as long as she lives. You will have to keep a close eye on the hubby though. Their electronic department in Isetan will have him pondering the prospects of how he is going to get his purchases home. 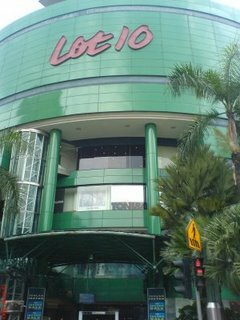 Lot 10 is one of the oldest shopping malls in KL and has become something of a landmark. The mall is center stage for all the other smaller shopping malls, food, and entertainment outlets that surround the big green giant. Connected by an overhead bridge to Sungei Wang Plaza, another shopping mall although not nearly as interesting as this mall. They also have another partner right beside them. 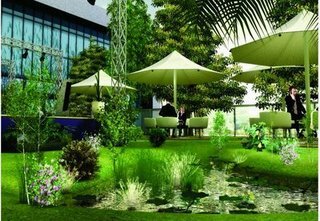 Starhill Gallery is an epitome of luxury for the high society shopper. When you visit Lot 10 you will be amazed at the popular items you can find, such as Calvin Klein, Guess, and Body Shop. This is the mall with it all. They also cater to the young professionals and socialites that visit the boutiques. 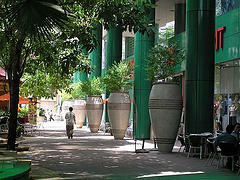 You will not miss it when you come to Kuala Lumpur because it is the only big green round building in the area.